I have been working madly to keep up with all of our harvest lately, with the worst yet to come, I am still doing a pretty good job of getting everything done. A lot of our harvest has been going into the freezer, due to cost issues, and not having enough canning jars for this big of a harvest, but I decided to make some sweet and spicy pickled beets for my daughter and mother in law these are one of their favorites and they look forward to them every year. These beets offer a bit more than the average pickled beet, and are a condiment that even I (who does not generally like anything pickled) will eat from time to time. When you are done with eating a jar of beets, save the liquid, this recipe makes the best pickled eggs ever. I started out with 4lbs of beets, you want to choose fairly small beets for this recipe, you can use either whole beets that are about an inch in diameter, or you can do like I did and used 2 inch beets and slice them. I used a postal scale to weigh my beets; you can get one of these or a food scale relatively inexpensively at Amazon or your local stores. Before you slice your beets you will need to cook them first, I normally scrub my beets with a green scrubby pad and take off the beet greens. You do not want to take off the crown of the beet so cut the greens of the beet just above that. Put your beets in a pot of water and cook until the beets are tender about 15 to 20 minutes, the skin should slip right off and the beets should be easy to cut. While waiting for the beets to cook it is a good time to get the rest of your equipment ready, you will need 5 to 6 pint jars, rings and lids and a water bath canner. You need to wash and sterilize your jars, lids and rings as well as get your canner filled and ready to start heating, you water should be at a simmer when it is time to put your filled jars into the water bath. Cool beets in ice water for a few minutes until they are cool enough to handle. Skins should slip off easily and now you can take off top and bottom of the beet. While the beets are cooling you can combine all the other ingredients into a pot and bring them to a boil, when the pot comes to a boil turn it down to low and let cook for about 6 minutes. 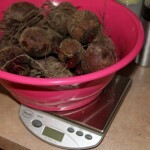 Slice beets 1/8″ – 1/4″ thick if you are not using them whole and add them to the pot with your liquid and seasonings. Heat the mixture until the beets are hot, then fill clean sterilized jars with beets and liquid. Leave a head space of 1/4″ clean rim of jars and put lids and rings on. Place jars in water bath canner of simmering water and bring to boil, process jars for 30 minutes. Leave beets on shelf for at least 2 weeks before opening for the best flavor. Scrub and rinse beets well, leave part of stem and do not cut the root from your beets. Doing this avoids loosing too much of the beet juice before you are ready to can them. 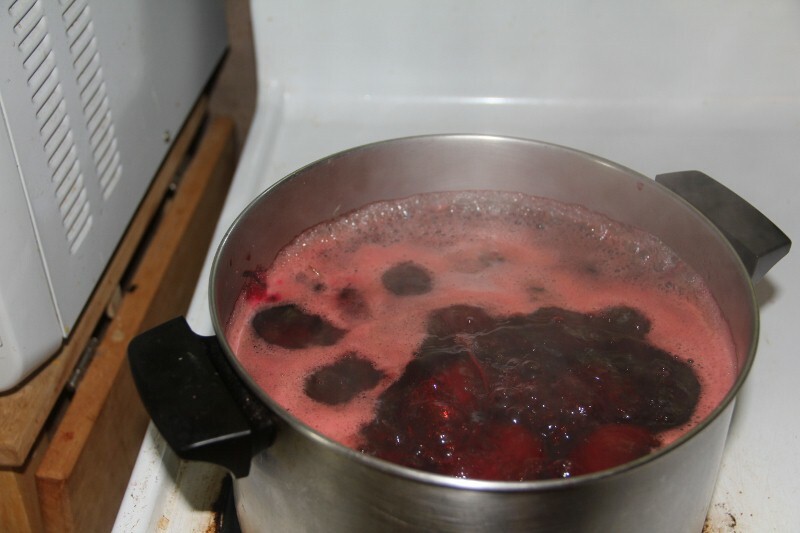 Fill large pot with beets and water and bring to boil, cook beets until fork tender and skin slips off easily. Drain beets and cool enough to be able to handle them, slip skins off beets, remove root and tops and slice beets ⅛" - ¼". Add onions, sugar, cinnamon stick, mustard seed, allspice, cloves, salt, vinegar and water to a large pot and bring to a boil. Turn down the heat to low and cook for 6 minutes. Add beets to the pot and cook until beets are hot. Pour beets and liquid into the hot sterilized jars, be sure to remove the cinnamon stick before doing so. Wipe rims of the jar and put lids and rings on the jars snuggly. 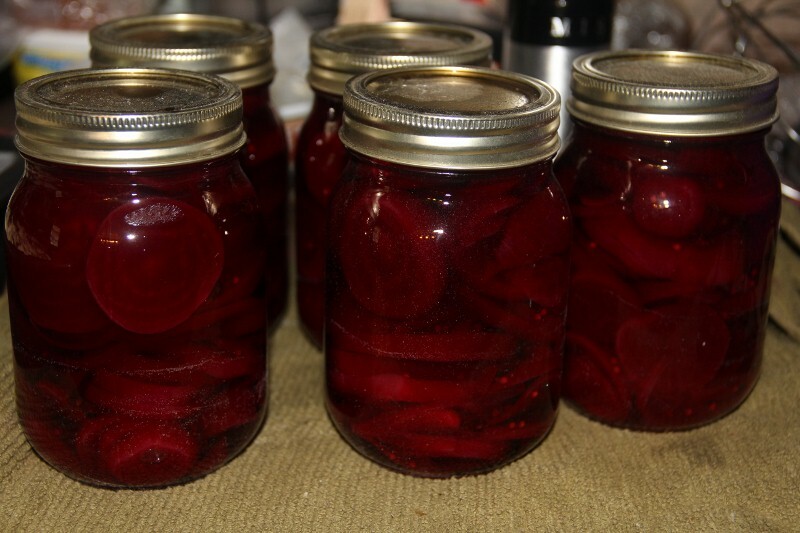 Process your pickled beets for 30 minutes in a water bath canner. Wait at least 2 weeks to open. Yours is very similar, and very very tasty! Thank you so much for posting it. This sounds like the beets I used to be able to buy in jars here in Holland. I’m certainly going to try making them! You also mention “pickled eggs” in your post, do you also have a recipe for those? Sounds great for my low carb diet! To make pickled eggs, you hard boil your eggs like normal. Take the liquid from the beets. and pour it over the eggs. Typically we wait until we have eaten an entire jar of beets before we use the liquid for eggs. Let them sit in a jar for a couple of days before you eat them. it would depend on how the beets are- towards the center, older beets tend to be woody or pithy. The best answer is to give it a try but watch the beets as you slice and dice them. Don’t worry about the cutting in half quarters or thirds no sweat, but make sure the insides are still tender. If when you cut them and they feel hard or strange I always eat one to see if it is tender enough to make a pickle. Some big beets are ok some are not. You can only try and judge for yourself.